Are you looking to get into the world of work and start earning and learning? Then you’ve come to the right place. Apprenticeships offer you debt-free education and training that can lead to degree level qualifications. 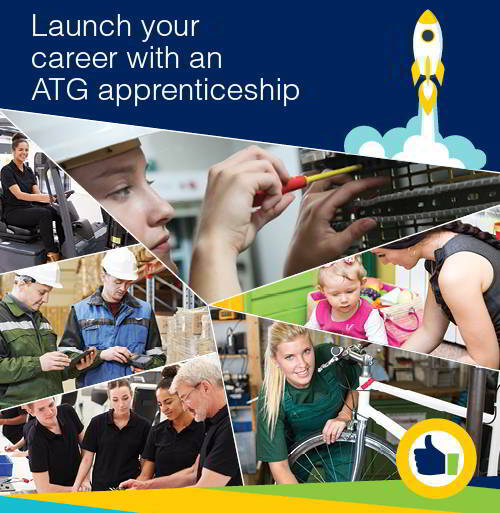 The ATG Training team are here to help you find a job that also provides vocational training; to start building your future career. On this website you will not only find a range of Apprenticeship jobs in Buckinghamshire, Oxfordshire and Berkshire, but also hints and tips on building your CV and a useful Questions and Answers section. Watch videos from current apprentices explaining how they have benefitted from securing an Apprenticeship in their own way. Help and advice is just a click away and we will call you back if you choose the ‘chat to an advisor feature’. Fay Chicken joined The University of Oxford on a training scheme. After successfully finishing the scheme in conjunction with ATG Training she has started a new position with CERN. My name is Jake Cousins, I work for Gibbs Gears. My employer is a manufacturer and my role is CNC programming. How did you come to be an Apprentice?